Amazing how some of these places latch on to something that might turn them a quick buck while there's demand. Relay is just a standard plug in relay that goes in the fuse box. Get one from Mitsubishi, Narva, Jaycar, etc. NowForThe5th wrote: Amazing how some of these places latch on to something that might turn them a quick buck while there's demand. Will Any 4 pin 30 amp do the job? did it have the plug on it. might get one if it does. The plug is on there.... it took me longer to remove the grill then to do the install..
Any pics guys? Does it have the feet and bolt on pattern correct? Didn't take any photos but it has the feet and it bolts on correct. Interestingly the MQ looks like it has the same mounting. I wonder if it's the same fan! Hey Jerrah, it is the same fan,but as yet I'm unable to find the plug to power it. gregned wrote: Hey Jerrah, it is the same fan,but as yet I'm unable to find the plug to power it. I was looking for a spot to mount my dc-dc charger and I found the plug just dangling there with some other plug with green insides near where the fan would mount. Not sure where the relay goes in the fusebox if it indeed uses a new relay as I think the layout is different MN vs MQ. What colours are the wires and how thick are they? I agree the fuse box is totally different. NOTE: This is a 2016 MQ. gregned wrote: Any chance of a picture? 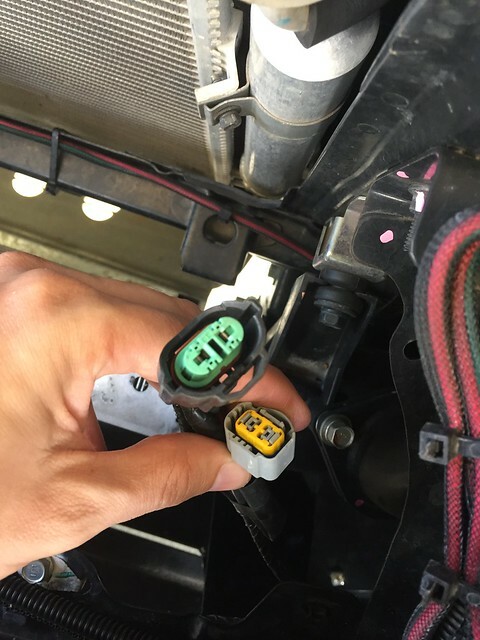 I believe (hope) the yellow plug is the same plug as on the MN. Sorry, my car has a bullbar, I have no idea where the cables were prior to the bullbar being fitted. The cables were dangling on the intercooler, I've cable tied them up out of the way now. I can't tell the colours from the photo, I could probably have a look through the grill tomorrow but I'm not going to pull the car apart again until the weekend. I guess the fusebox might have to be a process of elimination. I suspect the Pajero Sport WOULD have the fan as per the Challenger and the relay will be fitted. You could always visit a dealer and pop the top off the fuse box! Does anyone know a Pajero Sport owner? I have had a look at a Pajero Sport and it didn't have a fan in . My ute is a MY 16 exceed, if you get a chance can you please see where the cables come from or what they are tied too, it's really bothering me that I can't locate them. 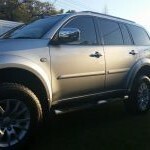 gregned wrote: I have had a look at a Pajero Sport and it didn't have a fan in. That's interesting. I thought it'd have the fan based on all the previous models. greened wrote: My ute is a MY 16 exceed, if you get a chance can you please see where the cables come from or what they are tied too, it's really bothering me that I can't locate them. I've got a 2016 GLX Plus. I doubt you'd have different wiring. If you remove the top plastic cover between the bumper and the engine bay and look down they're just to the right of the intercooler. That said the front of my vehicle has been cut off to fit a bullbar so I can't say if everything is where it was originally. 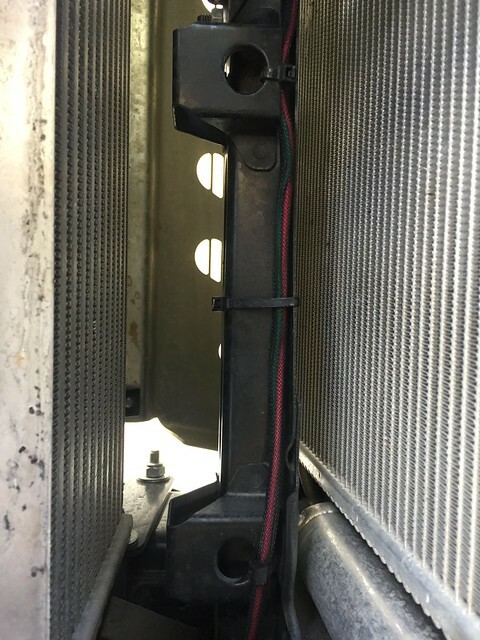 Can't believe they still haven't fitted the AC fan on the MQ, the Super cheap unit I installed on my ML has allowed icy cold air on a 33° day. Is that from the current model Pajero Sport? Where did you find that manual I could only find the recently superseded Challenger (with the name Pajero Sport overseas).. I don't suppose in that manual specifies which position in the fusebox the relay lives in? Or at least a wiring diagram? Awesome, thanks. I just need to work out the relay position now. That's disappointing. I can't seem to fully see your list of connections there. Is there an AC fan on it or am I going to have to Jerry rig something up?